Happy New Year, everyone! I know I’m a few days late (sorry about that! ), the early arrival of Haapsalu caught me completely by surprise. In any case, I’m very excited to be back and blogging again this week as I have been saving up quite a few things to share. The first thing I have today some of you may have seen, as its made it into the most popular patterns on Ravelry, the Burberry Inspired Cowl Neck Scarf by Julianne Smith. This next lovely little accessory I found on Ravelry is also going to be hard not to start (and leave half-finished for a month). Dapper, by Andrea Satterlund, is an adorable (and free, and quick!) pattern that I think is very now, and I love it; but, then I’m a bow person. 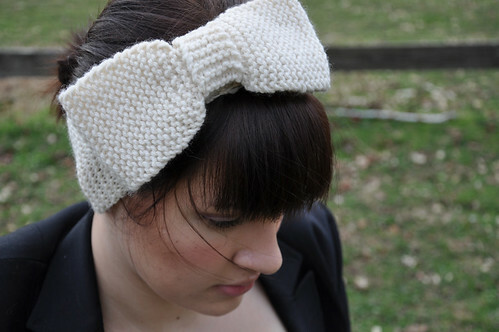 Can be worn as a headband or bow tie, done entirely in garter stitch, and adjustable this would be really fun to have for spring. Andrea has a really great crafty blog that I recommend checking out as well if you’re interested. If you, like me, have an Etsy browsing problem you may recognize the next lovely piece I have to share today. I first saw this beauty from Vart’s shop when it was featured on Etsy’s Holiday Gift Guides: Statement Gifts list and I have been thinking about it ever since. This beautiful hand felted shawl is made of 100% merino and is embellished with silk and Swarovski crystals. 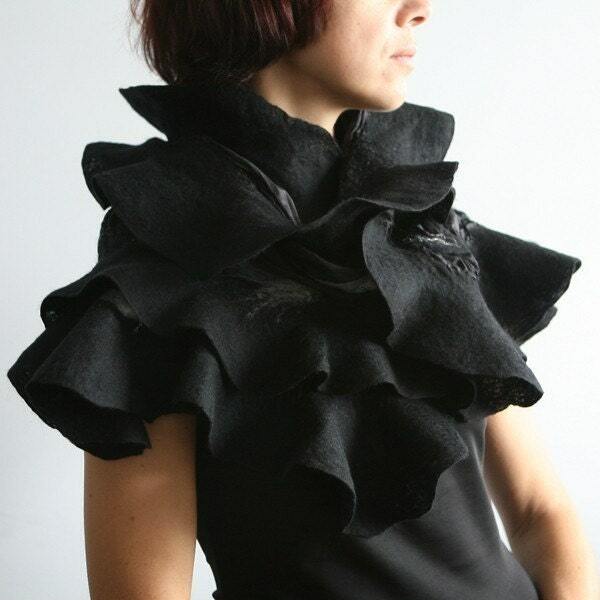 Really one of the most gorgeous nuno felt pieces I have ever seen and truly inspirational. Vart’s shop is full of other wonderful nuno felted accessories including bowls, bags, and jewelry. I really recommend checking it out. And, if you wanted to maybe try your own hand at nuno felting we have both a beginning and advanced class coming up with our fabulous felting teacher, LeBrie Rich of PenFelt. These are amazing, and I have to stop or I’m going to post them all. You can see the rest of her work on her website. I hope everyone had a great holiday season and is getting back into the swing of things easily. Have a wonderful weekend and check back next week for another edition of Fashionknista. Until then, stay chic blogfans! The post Fashionknitsta Thursday: 1/7/10 appeared first on Knit Purl Blog.